A Class Act for Schools and Groups! 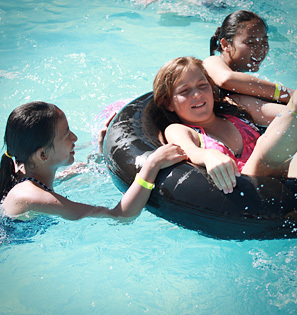 Timberline Ranch is the place to be for schools, youth groups and kids clubs, not to mention the perfect getaway for adult conferences. We have over 50 years of experience in hosting large groups, who return to us year after year for the pristine rural setting and amazing horseback riding programs. The staff at our Maple Ridge facility prides itself on accommodating the unique needs of each group; so if you have different requests for your educational excursion, conference or team building exercise, let us know! We invite you to learn more about us by reading our mission statement, checking out our facilities, reading our history and perusing the long list of activities we have planned to make your getaway experience unforgettable. Costs vary depending on many factors – including length of stay, meals required, activities provided, and others – but a mid-sized group can plan a three-day, two night trip for around $100.00 per person. Discounts are available for school groups, large groups, groups that come in the slower times of year, and for groups that stay longer than one night. You can contact the Ranch office regarding availability (604-463-9278 ext. 21 or via email). You can also download our rental contract agreement form so it’s ready to fill in and send with your booking deposit.